LONDON, England (CNN) -- The designers behind a "thinking" yacht are hoping to break a world record by sending it across the Atlantic Ocean without any human assistance. The four-meter boat, "Avalon", was designed and built by an eight-strong team of third-year engineering students at Swiss science university ETH Zurich. The students are planning to take the boat to a robotic sailing regatta in July, before launching it into the Microtransat Transatlantic challenge in early September. Using sensors to detect the speed and direction of the wind, the boat is programmed to reach a given co-ordinate and will attain it by automatically adapting to the changing conditions. One of the "Students Sailing Autonomously" (SSA) team's project managers, Hendrik Erckens, told CNN that if the Atlantic crossing succeeds it will be a world record as an unmanned boat has not previously made the voyage. It is planned the crossing will begin from the west coast of Ireland and finish in the Caribbean. Discover incredible super-yachts and get your sailing fix! "For us the Microtransat challenge is the big goal. I'm pretty confident we can do it. This week in testing it is pretty much doing what it's supposed to do. And it is water tight. "Over the last couple of days we tried some autonomous tacks and jibes and now we are testing the navigation," he said. The team has been working on the project since September 2008, and are currently at the on-water testing stage, having designed and built the boat. While the team will be able to track the boat through an onboard global positioning system (GPS) during the transatlantic voyage, Erckens said as long as the challenge is active they won't have any control over the vessel. "We will set it out and it will be completely autonomous. There are solar cells on the back for power and extra power supplies on board. "There is a satellite communication system on board and the boat can download weather information by itself so it can calculate the best route to travel," he said. Erckens said the team is positive that the carbon-fibre boat will survive the rough Atlantic seas -- an issue that has stopped many manned crossings before -- including Richard Branson's attempt at the fastest transatlantic crossing aboard the 99-foot Virgin Money last fall. "We feel our advantage over other teams is that we are mechanical engineers. 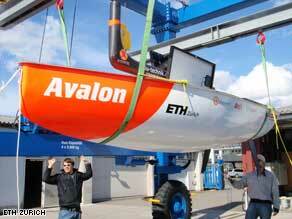 We have designed this boat ourselves and exactly for this purpose." Erckens said the idea could one day offer a new autopilot option for large yachts. "The idea came as there are autopilots for boats out there, but currently the commercially available autopilots only steer the rudder. We are looking to control the sails as well."